A combination of historical architectural details come together beautifully in this well conceived piece. 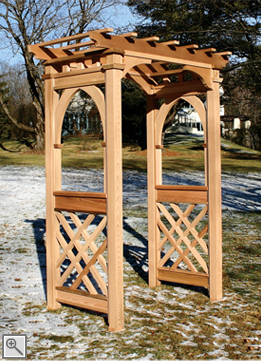 Whether your home is of a traditional classic design or has tudor, gothic or French country detailing, this arbor would be a perfect accent. 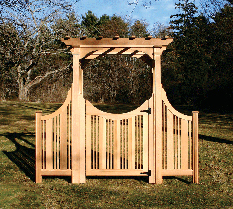 The arbor is shown here with our Privacy Gate Five and the Board and Baluster Extensions, but may be used in combination with any of our other gate and extension styles as referenced in the Arbor Gates and Extensions section. 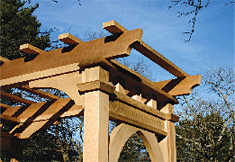 The lower side panels consist of substantial 1½" x 1½" lattice in a traditional diamond pattern. 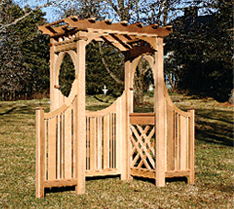 The opening for this arbor may be altered to any size up to 6'.